Join us for our upcoming market update call. Will Stocks Crash if Trump Is Impeached? · As of September 4th, betting markets suggested a 45% probability of President Trump being impeached by the end of his first term. · In 1998, prospects of President Clinton’s impeachment and possible removal from office arguably caused a nearly 15% selloff in the S&P 500. · As we see it, the Federal Reserve’s tightening campaign and strong dollar, and the stresses they create on emerging markets, are some of the most important macroeconomic risks today. A Presidential impeachment process is an additional tail risk to consider. As of September 4th, Predictit betting markets suggested a 68% probability of Democrats regaining control of the House in 2019, and a 45% chance of President Trump being impeached by the end of his first term. While the House has the power to impeach the President, only the Senate can remove him from office. And at the moment, Predictit markets suggest a 78% probability of Republicans maintaining control of the Senate next year. But despite the expected Republican foothold in the Senate, some political observers see a real possibility of the President being impeached if Democrats take back the House. Underscoring the seriousness of this possibility, if betting markets today are accurate, then the probability of an impeachment process in the coming years is virtually a coin flip. To think through the market implications, the only precedent we can examine in the modern era is the Clinton impeachment proceedings in late 1998, early 1999. “Trump Declares ‘Market Would Crash’ If Democrats Impeached Him,” by Brooke Singman, August 23, 2018, Fox News. Based on the timeline of events in those Clinton years, it appears that much of the stock market pain occurred between the announcement of Monica Lewinsky’s immunity deal on July 28, 1998 and the release of the Ken Starr report on September 9, 1998. Based on the closing prices for the S&P 500 on July 27 (the day prior to the deal announcement) and September 10 (the day after the report’s release), the S&P 500 fell 14.6%. As CNN reported at the time, the plea deal followed a meeting between Lewinsky and Starr, in which Lewinsky admitted to having a sexual relationship with President Clinton. This reportedly contradicted sworn testimony from both Lewinsky and Clinton in the Paula Jones sexual harassment case where both denied having such a relationship. President Clinton’s impeachment process was initiated in December 1998 after the Republican-controlled House passed two articles of impeachment, for perjury and obstruction of justice. By January 1999, the trial commenced in the Senate where Republicans controlled 55 seats. Given that Clinton’s removal from office required the support of two-thirds of the Senate, it seems that by late 1998, it was increasingly assured that, as many Democrats defended him, the President would not be forced out of office. Ultimately, 50 senators voted to remove Clinton on the obstruction of justice charge, while 45 voted to remove him on the perjury charge. The vote didn’t come close to the required 67. Arguably, the selloff in the S&P 500 between July and September 1998 occurred because the market was digesting the initial information of Clinton’s perceived perjury and the possibility of his removal. And over time, between September and year-end, the market seemed to assess (correctly) that the probability of Clinton’s ultimate impeachment and removal from office was very low – allowing stocks to regain their previous highs. Credit conditions in 1998-1999 also appear to show a correlation to the Clinton impeachment events, but in a slightly different way. While stocks seemed to discount the worst of Clinton’s prospects between July and September 1998, the credit market represented by the spread between Baa and Aaa-rated corporate bonds widened almost consistently until late January, early February 1999 when Clinton’s acquittal was almost certain; and then the credit spread began to narrow. Of course, financial markets aren’t driven by one factor alone, and there were other macro variables impacting markets during the Clinton impeachment period – namely the Russian debt default and currency crisis. Of the critical dates associated with the Russian Crisis, two dates especially stand out. On August 17, 1998, the Russian government announced a significant devaluation of the ruble, whereby the ruble would be allowed to fall by up to 50% to 6.00-9.50 rubles per U.S. dollar, compared to 6.27 rubles during the day prior to the announcement and from a previous band of 5.27 to 7.13. At the same time, the government defaulted on short-term Treasury Bills known as GKO’s and longer-term ruble-denominated bonds known as OFZ’s. Additionally, a moratorium was imposed on payments by commercial banks to foreign creditors. Importantly, though, the Russian debt default and devaluation did not appear to coincide with a serious disruption in US stock and credit markets, at least in terms of the daily prices of the S&P 500 and the Baa-Aaa credit spread around those specific dates. On August 17, the S&P 500 actually rose 1.96%, compared to the previous day’s close. And it rose an additional 1.61% on Tuesday August 18. Additionally, the Baa-Aaa spread narrowed to 61 basis points on August 17 and 18, compared to 62 basis points on Friday August 14. Furthermore, between September 2 and September 9 as the ruble devalued from approximately 9 to more than 20 per dollar, the S&P 500 rose 1.59% from 990.48 to 1006.20, while the Baa-Aaa spread traded around 64-65 basis points. Of course, this is not to say that the Russian default and currency crisis had no impact on certain segments of the market in 1998. Indeed, the investment losses at Long-Term Capital Management in August and September 1998 appeared to be related to the events in Russia, prompting the Federal Reserve to step in and facilitate a capital infusion. But parsing through the news flow that year suggests that the events leading up to the Clinton impeachment may have been a key variable behind the nearly 15% selloff in the S&P 500 and more than 40 basis point widening in the Baa-Aaa credit spread. In this context, as we look at the market environment today, we continue to believe that the Federal Reserve’s tightening campaign and the strong dollar (and the stresses they may create for emerging markets) are some of the most important macroeconomic risks facing financial markets. And, based on the history of 1998, a Presidential impeachment process may be an additional tail risk to consider. Paul Hoffmeister is chief economist of Camelot Portfolios, managing member of Camelot Event-Driven Advisors, and co-portfolio manager of Camelot Event-Driven Fund (tickers: EVDIX, EVDAX). “An Overview of the Impeachment Process”, by T.J. Halstead, Legislative Attorney, American Law Division, April 20, 2005, Congressional Research Service, Library of Congress. “Lewinsky Strikes Far-Reaching Immunity Deal”, by Wolf Blitzer and Bob Franken, CNN AllPolitics, July 28, 1998. “Clinton Impeachment Timeline”, By Patrick Barkham, November 18, 1998, The Guardian. “How the Senators Voted on Impeachment”, February 12, 1999, CNN ALLPolitics. “Russia Acts to Fix Sinking Finances”, by Celestine Bohlen, August 18, 1998, New York Times. “A Case Study of a Currency Crisis”, by Abbigail Chiodo and Michael Owyang, November/December 2002, St. Louis Federal Reserve Bank. Data Source: Yahoo Finance and St. Louis Federal Reserve Bank. “Near Failure of Long-Term Capital Management”, November 22, 2013, Federal Reserve History, Federal Reserve Bank of Richmond. • House Ways and Means Committee released outlines of another round of tax cuts. • Key features of Tax Reform 2.0 could be to make permanent the recent individual income tax cuts and index capital gains for inflation. • We believe, at the present macro trajectory, tax cuts can buy more growth, but monetary policy will ultimately determine the duration of the recent economic resurgence. On the heels of the framework’s release, stocks hit post-February highs. Based on the S&P 500’s closing price on July 25, the S&P 500 jumped nearly 1.4% compared to its close on July 23. In our view, one of the most important variables that impacted financial markets in February was growing concern about the Federal Reserve raising interest rates more aggressively than previously expected. Of course, there are almost countless variables that drive markets. It’s possible investor complacency heading into February and seemingly crowded, short volatility positions contributed to or intensified the stock market panic last month. The S&P 500 peaked on January 26th and appeared to really begin its selloff on Friday, February 2nd when the US Bureau of Labor Statistics’ release of average hourly earnings showed surprisingly strong year-over-year growth of 2.9%, compared to the median expectation of 2.6% growth. 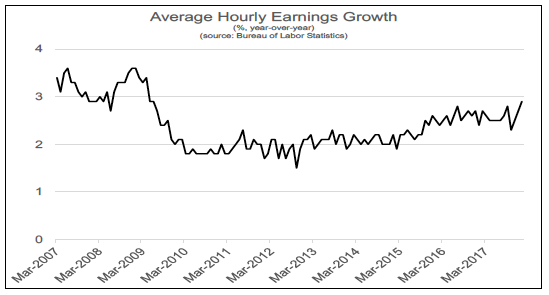 The strength in employee earnings growth is now at a post-financial crisis high and has sparked concerns of accelerating inflation down the road that may need to be addressed by stronger monetary tightening. The concern is predicated on the theory of wage push inflation, where end market prices of goods and services are preceded by increases in employment costs. According to the Chicago Mercantile Exchange, futures markets estimated at the end of February a nearly 25% probability of a 2.25-2.50% federal funds rate target by December 19, which is the FOMC’s last meeting of the year. This would equate to four quarter point increases to the funds rate for 2018. At the end of January, the probability of a 2.25-2.50% funds rate target was approximately 21%; it was almost 9% at the beginning of the year.